You may not have a vintage home or an architectural pedigree, but you can give your home a touch of history - inside and out - with some newfangled, old-fashioned, architectural, exterior trim embellishments of a period style. 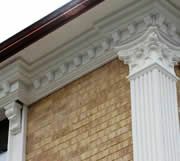 Elements such as columns and architectural trims can be added to embellish a home's facade, add to its value, and provide the look and feel of a period home. All the embellishments you need to transform a timid tract house or run-of-the-mill ranch are accessible and relatively easy to install. 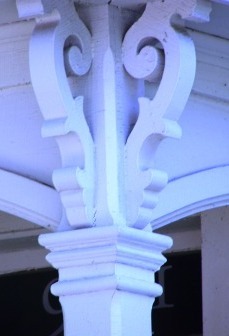 Decorative moldings and millwork for exterior trim found on Victorians, Georgians and Colonials are still being made and are as close as your local lumberyard or remodeling contractor. 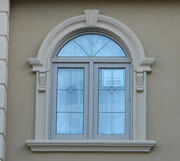 All of these architectural trim components and hundreds more come in a variety of traditional and contemporary styles. They are available in standard and custom dimensions. Some can be installed over existing siding or window and door trim. In other cases, siding may have to be trimmed back and existing trim removed before being replaced. Most exterior and interior trim and millwork is made of wood. Recently high-density polyurethane moldings, caste resin and expanded polystyrene foam moldings(EPS) have been developed. They are waterproof, weather-resistant and impervious to rotting, warping, splintering, splitting and insect damage. Fiberglass-reinforced polymer columns for use inside or out are available in dozens of sizes and styles. Although plastics may sound perfect for outdoor use please read"Why Wood" to gain a broader knowledge. You can get manufacturers' brochures and millwork catalogs through the mail, via the Internet or from your local lumberyard or home improvement store. Familiarize yourself with the styles, names and dimensions of architectural trims. Also, study decorating, remodeling and home building magazines, look for exterior trim details. Compile clippings of facades, entryways, doors, windows and porches you find appealing. This will smooth and speed the process when designing and talking with your architect, builder, or trim carpenter. If you're going to do the job yourself, you can take your portfolio to a lumber dealer to get the components you'll need. If they don't have what you need it will give them a good idea of what you have in mind and you may be able to modify your designs with their products. Although there are just a few standard moulding styles that many dealers carry there are what seems to be an infinite variety of mouldings, millwork and gingerbread available with a little digging. 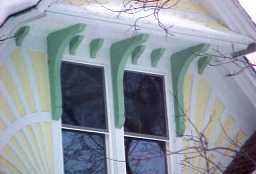 Cost will depend on who does the work, how much work there is to be done and how elaborate the trim is. But it can cost as little as a few hundred dollars to trim out a front door on the outside or a dining room window on the inside. In terms of curb appeal and ambiance, it's often a justifiable expense. Always avoid the temptation to overdo it. Architectural embellishments work best when used with restraint. Their style, scale and proportions should be in sync with the style, scale and proportions of the house itself. In order to transform a house into a period statement it is important to use Exterior trim suitable for the period. A mix will create confusion and leave the observer with confusion and a " if they would only have.." thought. Add enough delicate and subtle ornament to give your home architectural character. If you can afford to add architectural millwork all the way around the house, fine, it may be that creating an architecturally interesting entryway with a distinctive door, sidelights trimmed with vertical pilasters and maybe an elaborate carved-looking pediment overhead is all the front of your home will need to create an inviting character. You can also do things in stages - this year the front door, and next year the windows. Finding a matching molding pattern later won't be a problem. On the interior, however, you'll want all the window and door trim in a given room to match. You can reserve the highly decorative moldings for the living or dining room and use plainer trims in the bedrooms and baths. The mood expressed by homes during the architectural periods were and have always been one of pride in a changing, beautiful America. Some homes were designed as showplaces and some homes were just homes displaying the love of freedom and design. Each home was to be as individual on the exterior as as well as the interior. < a> Columns Columns are a wonderful structural investment for your home. Adding columns often elevate the home to a whole new market as they declare the home’s architectural significance and prestige. < a> Exterior Lighting Although not normally the pervue of the finish carpenter exterior lighting can dramatically enhance the architectural trim of a home. < a> Garden Gates A beautiful touch to the entrance of a garden or yard. < a> Fireplace Mantels and Surrounds It’s possible to change the look of a fireplace dramatically.